« Today I am mostly….. 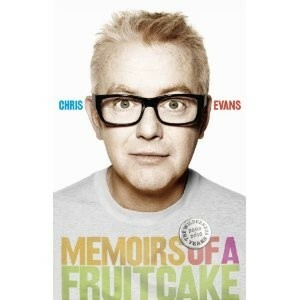 I am not a Chris Evans fan, I mean in that I am not a big follower of his, I don’t dislike him, I used to watch and enjoy ‘Don’t forget your toothbrush’ and ‘TFI’ and I have thought he is a bit of a fruitcake, you know I probably wouldn’t have read his book if I hadn’t been sent it for review! So I didn’t know what to expect from ‘Memoirs of a Fruitcake‘, but I suppose that was good, it meant I just had to read it to find out what I would think! Well, this book was great to read, I did wonder whether I may not get into this book as I hadn’t read Chris’ first book, but I needn’t have worried, it didn’t matter at all. The book is written how Chris speaks, it is very easy to read and you feel like you are being told the story by the man himself, which I guess you are, but it is obvious that there hasn’t been too much editing or someone writing on his behalf. The book is full of his love life, his mistakes and interesting snippets from his ‘Wilderness years 2000-2010’. There are some photos thrown in too, which really adds that extra personal touch to the whole book! I was surprised by how drawn in I was to the tales of his life, the ups and downs (of which there are a few of both) really keep you interested and at times I couldn’t put the book down! I really enjoyed it, reading both the funny and serious bits and would say it was a definite recommended read if you like autobiographies! If Chris Evans was to write another book, I most definitely would read it! I wondered the same about it but I may go for it now. I did spot the library had a copy in! I was never a fan, and I really wasn’t sure how I’d cope with him on Radio 2 in the morning (I am not a huge Terry Wogan fan but he kind of had it down to a tee).